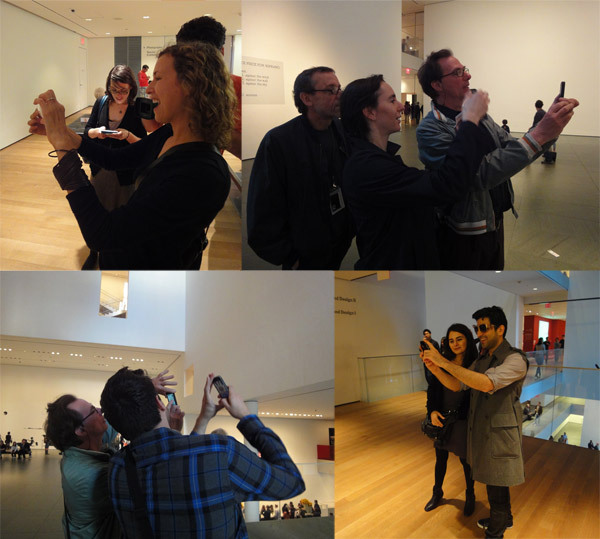 Sander Veenhof and Mark Skwarek cordially invite you to the "WeARinMoMA" exhibition in the MoMA NY, featuring augmented reality art in its proper context: a contemporary art museum. At the same time, the 'art invasion' annex exhibition showcases the radical new possibilies and implications Augmented Reality is bringing to the cultural and creative field. With the exhibition, the organisers of the event aim to address a contemporary issue, caused by the rapid rise of Augmented Reality usage. What is the impact of AR on our public and private spaces? Is the distinction between the two fading, or are we approaching a situation with an even increasing fragmentation of realities to be perceived individually? Developments in the field of phychogeography advance rapidly and radically. While in former times the discipline required the mental capabilities of concentration and imagination, nowadays mobile phones provide us all with easy-to-use viewing tools to perceive a multitude of fictive realities, anywhere we are, instantly. The technique causing this radical 'progression' is named augmented reality: 2D annotations of the world around us or the visual integration of 3D shapes into our physical space, to be experienced by looking through a networked GPS capable smartphone, walking through the streets. The availability of augmented reality applications on many iPhones and Android phones, brings the basic notion of phychogeography to the masses. People are becoming more and more familiar with hybrid realities. With people taking imaginative realities for granted, technically within the reach of anybody, the challenge for contemporary psychogeographers is to come up with strong concepts that differentiate. Crossing more than just the physical/imaginative boundaries. Actually, the discipline is back where it originated. Easy-to-use AR tools such as the Layar AR viewer have led to an explosion of virtual creativity in our public physical space. Every major city square now hosts numerous virtual sculptures. Actually, augmented reality has changes the scope of 'public space'. Any space has become public! Even physically walled private spaces are now open areas for anyone to use or re-shape. Combining this development and the fact that creative tools are turning many people into creative artists, the scope of "what is art" is once again questioned. Because besides the difficult qualitative judgement, the former 'helper' criterium of whether something was placed within museum walls or not, is no longer valid. Virtual artworks by 'non artists' could mix with officially curated art within an official museum. The museum offers the white cube and walls, the visitor decides what to see, curators are bypassed. 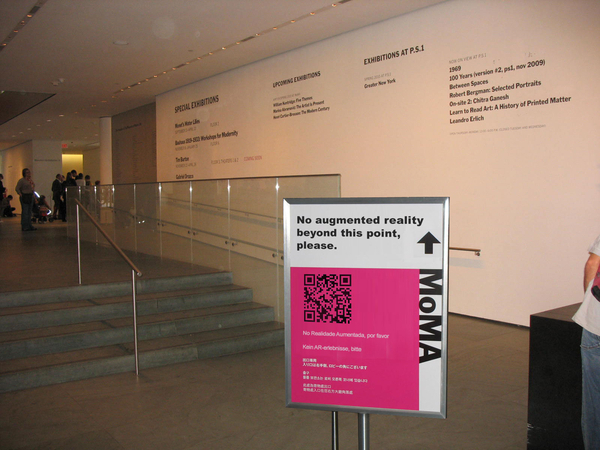 To demonstrate the implications of this new development and to trigger a debate on the impact and whether an appropriate response is needed, I Twittered a photo of a signpost fictively positioned within the MoMA (above) stating: "No augmented reality beyond this point please. The message has made people realise that the orderly world as we know it, is in flux. The sign evoked pro and contra reactions by artists, inspiring some of them to send me suggestions for works of art reflecting on the topic: virtual works to be placed inside the MoMA. Or in front of it, to protect the institute against the upcoming invasion of augmented reality art, as was suggested by artist Mark Skwarek from Brooklyn, NY. His contra-contra reaction, was the trigger for this cooperative Conflux2010 proposal. Augmented Reality (AR) is the phenomenon adding virtual elements into our physical reality. These addition are viewable by pointing your contemporary smartphone to the world around you. The phone knows where you are (because of GPS) and with this data it connects to the internet to get the relevant images, visuals, 3D shapes and it puts them into your view. 'AR' technology allows anyone to (re-)shape anything, anywhere! 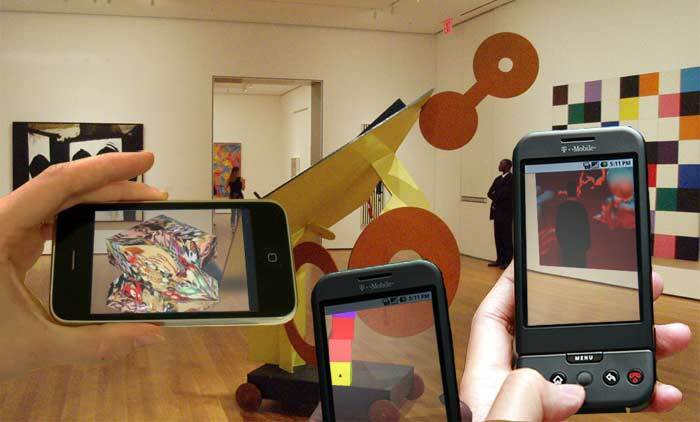 An example: the MoMA building NY will host a 'virtual' augmented reality show on the 9th of October 2010 But, they don't know about it yet. The infiltration is part of the Conflux Psychogeoraphy festival.